If you’re reading this, you probably watched my DIY ramp video and are looking for instructions. Please keep in mind that these instructions are to be followed loosely, and are made for someone who has a little woodworking experience already. I cannot tell you how to use a drill, how to change a saw blade, or why something isn’t working. I’m not a carpenter, and I’m certainly not a professional ramp builder. Please do not contact me asking questions about the ramp. I love each and every one of you, but I can’t provide carpentry advice. So, with this understanding, the materials list and instructions below should get you the same ramp pictured in the video. 1 Piece of 1/2″ plywood. Sometimes this will be called 9/16″, which is fine. 4 2×4’s, 10 feet in length. You will have extra wood, and actually you could get away with three 10 footers and one 8 footer. Well what about the curve? Well, that’s where the little bits of woodworking experience and common sense come in. Making the curve can be done with a piece of PVC pipe, or even using a string like a compass. Make sure the bend is really mellow, as this is a small ramp. Once you’ve made your bend and cut your piece out, the measurement of the ramp surface is going to be different from mine for sure, so it’s up to you to measure it. My advice is to go a little long, and then cut off the excess until it meets nicely with the ground. The back piece I believe was around 22″, but just do yourself a favor and measure it. The next time I use the ramp I’ll measure it and put the number here. 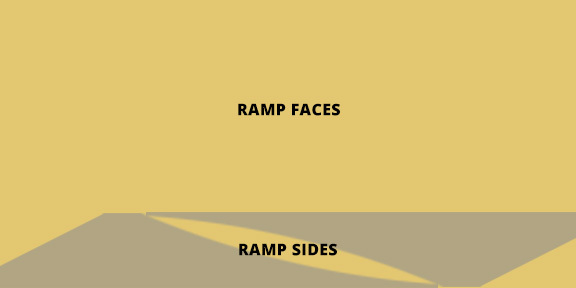 You’ll have plenty of plywood for all the ramp faces though, that’s for sure. So that’s pretty much it. Like I said, anyone with some woodworking experience should be able to figure this out just by looking at these instructions and diagrams. If you can’t, then more instructions would likely not help you. Even if I provided all of the measurements and steps in great detail, you could still get warped 2×4’s, or mess something up and not know what to do. So with that, I hope you have fun on your new ramp! Be safe, make sure there are no screws sticking out, and remember to sit the ramp on a level surface for best results.